'All About Presentations' by Jazz Factory: How to password protect your presentation? How to password protect your presentation? 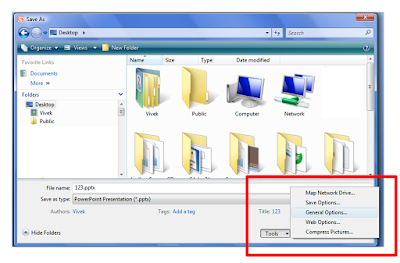 Case #1 You have a confidential presentation on your desktop and you don't want anyone else to see that presentation. How do you password protect your presentation such that no one else can open the presentation? Only people who know the password can open the presentation. Case #2 You are a sales manager and you are sending a presentation to a client. You want the presentation to be 'read only', which means that the recipient can only view the presentation but not modify it. How do you do that? We will first figure out how to address Case #1. 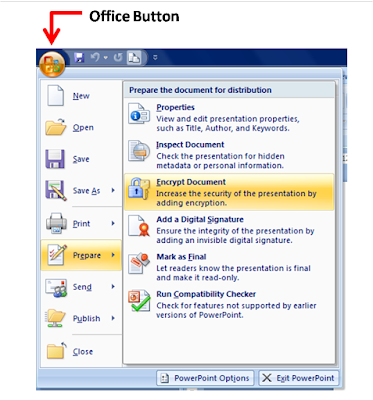 Click on the Office Button -> Go to 'Prepare' -> Encrypt Document. After you click on it, you can enter the password and press ok. Then you will be asked to re-type the password. Whenever, someone tries to open the presentation, he/she will be asked to enter the password as well. Once they enter the correct password, they are allowed to open and edit the presentation (which includes changing the password or removing the password). 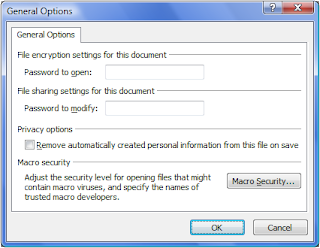 To remove the password, you can go to Encrypt Document and delete the password and press ok.
Click on the Office Button -> Save As -> Tools -> General Options. To make the presentation read-only, enter the password ONLY in the first box which reads 'Password to open'. If you send this presentation to someone, they will be asked to enter the password, to open and view the presentation. On entering the correct password they will be allowed to view the presentation but they will not be allowed to modify anything. If you wish to have another password which allows people to modify the presentation, then also enter a password in the second box which reads 'Password to modify'. If you do not wish to create this password, leave the space blank. Think of situations when you need to password protect your presentation? How have you been protecting your presentations in the past?